The Troy Bilt Squall 2100 Snow Blower is a serious step up from the Troy Bilt Flurry 1400 Snow Blower and the Troy Bilt Squall 210 Snow Blower. It is a quite a lot more powerful with a 0.21 liter engine. This is a 4 stroke engine which means that you don’t have to spend your morning in the cold mixing oil with gasoline. You also don’t need to fumble around with a recoil, pull cord starting system as you can just start this machine at the touch of a button (although the recoil system is there for back up, just in case). The Troy Bilt Squall 2100 snow blower is a single stage snow blower which means there is no impeller to force the snow through the chute. Instead there is only auger which measures 0.23 m (9 inches) in diameter. Luckily though this has serrated edges that will quickly and almost effortlessly break up the snow and ice. Once the snow has been smashed and destroyed, it’s shuffled towards the chute and forced out of it. But the auger is not only used for breaking up the snow and sending it through the chute, it also grips the ground as it rotates and pulls the machine forward. The wheels on this machine are 0.05 m (2 inches) wide and have a diameter of 0.2 m (8 inches). This don’t offer much grip, but don’t need to as it’s the auger that’s driving the machine forward. The chute on the Troy Bilt Squall 2100 snow blower can rotate through 180 degrees. The clearing width of the snow thrower measures 0.53 m (21 inches) and it has a clearing height of 0.25 m (10 inches). Most people will find this 21 inch snow blower or Troy Bilt’s other 21 inch snow blower, the Troy Bilt Squall 210 Snow Blower perfectly adequate for clearing their driveways. 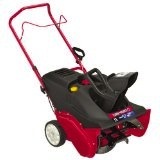 Click Here to buy the Troy Bilt Squall 2100 Snow Blower. Definitely wouldn’t recommend this snow thrower. Cons: Don’t but this one! I live east of Cleveland Ohio on the edge of the snow belt, so I’m no stranger to snow removal. If the snow is even a little sticky, it packs the wheels so they don’t turn. If you want aerobic exercise, you’ll get it. The Squall 2100 takes nearly as much effort to push with the wheels caked, as it does to shovel. At the end of this snow storm, I’m going to replace the wheels. Modifications: Going to put new wheels on it.